What is Bias Lighting, and Why You Should Be Using It. Bias lighting (sometimes called mood lighting) is a very basic concept! It is any sort of ambient lighting that you have placed behind your television monitor. In layman terms, it is basically putting a lamp behind your TV. Reasons you should get it! #1 It can be painful for your eyes to adjust to a bright screen in a dark room. In fact, a bright screen can be harmful to your eyes! Bias lighting helps tame the appearance of the bright screen to your eyes. It makes it so that there isn't a big drop off in lumens from the border/frame to the back of the room. You may be thinking, why don't I just turn the light on in the room while I'm watching TV then? This actually would help reduce the strain on your eyes, however, it also creates new problems. Lighting that is not located directly behind the TV actually presents a hazier picture with poorer contrast to your eyes.This is due to the glare created by light reflecting off of your TV. The advantage of bias lighting is that it is not directly in your line of sight when you are watching TV, so you get all the benefits of a more luminous room without the side effects. #2 Bias lighting can help with the letterbox (that isn't as dark as it could be) when watching movies and sports. It simply tricks the iris down a little and makes the blacks/ grays on your screen look richer. It does this because blacks and grays look clearer on a lighter background. So now you don't have to destroy the backlight on your HDTV by adjusting the values of brightness and contrast to the point that it feels like you're a deer staring down an 18 wheeler's headlights. #3 Essentially, bias lighting improves the deception of contrast. It is especially useful on less expensive or not an extremely high-performance TV! We at Tekbotic can not say enough good things! It is a cheap solution to creating a higher quality entertainment experience and getting the most out of your TV. TIP #1 Make sure the bulb you get is a neutral/gray color or warm white (6500 Kelvin). NOT A COLORED LIGHTBULB! 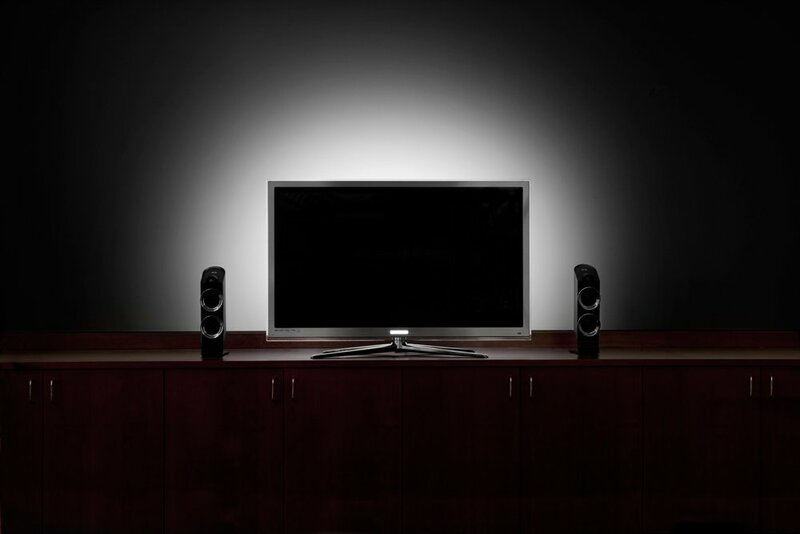 TIP #2 Ideally, you want the light emanating from all sides of your TV. Fluorescent tube lighting and LED light strips are both inexpensive and easy options! Leave a comment below if you have any questions or share your experience with bias lighting!